On June 02, 2014, 29th State of India is born named Telangana. It was earlier a part of Andhra Pradesh. The remaining part of old Andhra Pradesh will be called Seemandhra. 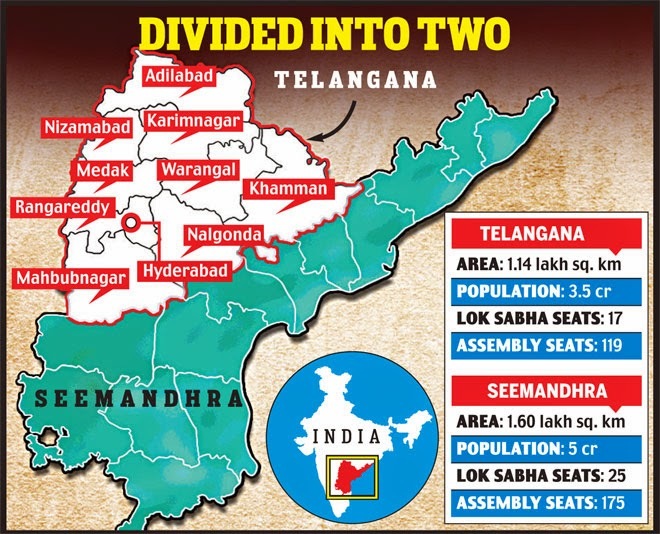 The formation of Telangana is likely to leave the successor State of Andhra Pradesh seriously short-changed in education. Not only does the new State have the location advantage for attracting the best institutes, Hyderabad, which will remain part of Telangana, already boasts some of the biggest institutions. We will need to see what will change with EAMCET Engineering and EAMCET Medical entrance exams. For now, we assume it will allow admission to all the colleges of old Andhra Pradesh. Other popular institutes in Telangana will be - the ISB (Indian School of Business), NIFT (National Institute of Fashion Technology), NALSAR (National Academy of Legal Studies and Research), and ICFAI (Institute of Chartered Financial Analysts of India). Join more than 15,000 students in preparing for EAMCET in 2015 on simplylearnt.com.